Bringing Back Broadway is a 10-year strategic economic development plan launched in 2008 for the revitalization of the historic Broadway corridor in Downtown Los Angeles. Initiated by Los Angeles Councilmember José Huizar, Bringing Back Broadway has been a tremendous success. While the focused 10-year effort is winding to its end, the legacy of Bringing Back Broadway will continue to flourish for years to come, like a carefully tended tree that has been nurtured, has taken root, and will continue to bear fruit. The initiative began with goals to provide economic development and business assistance; encourage historic preservation; stimulate reactivation of Broadway’s historic theaters and long-underutilized commercial buildings; and increase transit and development options by bringing a streetcar back to downtown Los Angeles with Broadway as the spine for the route. City policies aimed at spurring this revitalization through Bringing Back Broadway include the City’s Historic Commercial Reuse Guidelines, Broadway Entertainment Zone policies, a facade lighting grant program, the Historic Broadway Sign District, and the Broadway Streetscape plan, which prioritizes people over vehicles and creates a safer and more vibrant pedestrian experience along Broadway. As a result, the initiative has incentivized nearly $1 billion in investment on a previously struggling street that now thrives. The area has experienced a surge in new retail and restaurants, becoming a focal point for creative office and boutique hotel development. What was once a street utilized to get from one place to another has become a destination. Hundreds of thousands of people come to Broadway annually to enjoy hospitality, art, entertainment, and a truly unique, urban pedestrian experience in the heart of Downtown L.A. Viva Broadway! 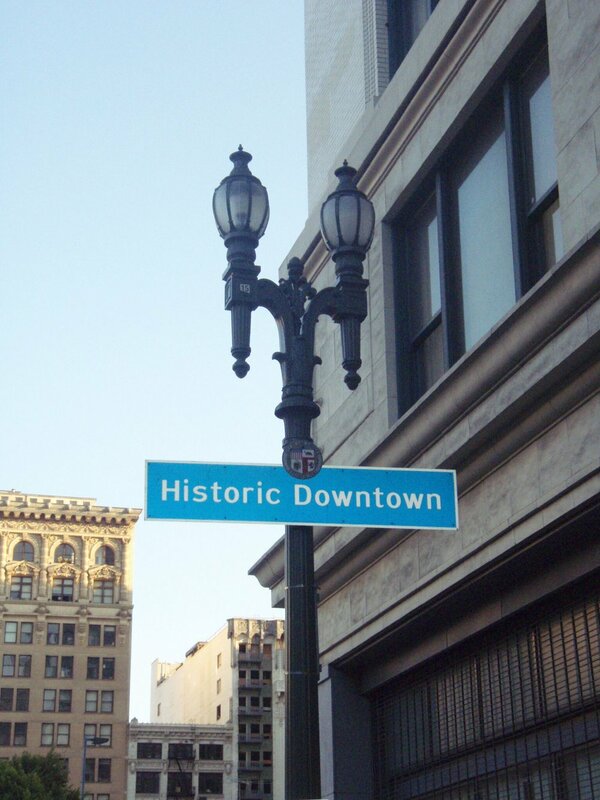 The historic Broadway corridor, part of an important National Register Historic District, is located in the center of downtown Los Angeles and in the heart of the Historic Core. Broadway enjoys a colorful history as the birthplace of vaudeville and cinematic entertainment in Los Angeles and was once considered the retail capital of the United States. It features one of the largest concentrations of historic theatres on one street in the nation with twelve beautiful theatres located within nine blocks, set between a bevy of beautiful architectural gems. These structures stand in tribute to the architectural and engineering achievements of the early 20th century, and along with the theatres, contributed to Broadway's prominence as an important west coast center for business and commerce. Broadway was also one of the most popular destinations for Angelenos and tourists utilizing the city's former streetcar system. Broadway was an important part of the historic Route 66. In fact 7th & Broadway was the original terminus for Route 66, and an important corridor for the business and commercial activity that was integral to that route in developing pathways through the west. For its rich history and tremendous future potential, Broadway is a true treasure in Los Angeles which was not meeting its potential in a number of different ways when Bringing Back Broadway was launched. Merchants were struggling with a 20%+ ground floor vacancy rate as retail customers were increasingly being lured away to municipalities offering a wider variety of goods, services, and family activities in one stop. This ground floor struggle was made worse when viewed in context of more than a million square feet of vacant space in the upper floors along Broadway, providing no jobs, revenue, opportunity or continual support for ground floor activity. While one theatre was active, most of the glorious historic theatres did not offer regular entertainment programming, and Broadway wasn’t serving the needs of the diverse downtown community and its residents, workers and visitors - especially at night. These challenges combined to threaten the long-term utility of this precious historic corridor, and also reduce the City's ability to capture revenue, create and retain jobs and to sustain the viability of its urban center Downtown, which, as the main economic driver in the region, has a profound ripple effect in areas far beyond Broadway. I consider the downtown Historic Broadway Theatre District, with one of the largest concentrations of historic theaters in the country, and an amazing array of important commercial buildings, a true treasure of Los Angeles - one which deserves to be revitalized, protected, preserved and made vital for future generations. Bringing Back Broadway is one of my highest priorities as a City Councilmember. I initiated Bringing Back Broadway because I believe the City must honor its history as significantly as its plans for the future. Bringing Back Broadway is a ten year vision – and an ambitious plan – to revitalize the corridor, activate the theaters, reactive more than a vacant commercial space, create a sense of place and history through urban planning, design and streetscapes, and make the dream of once again riding a streetcar downtown a reality. Historic preservation is not about pressing the pause button on what we had in decades past, but is about finding new and innovative ways to ensure the vitality and functionality of historic structures as time marches on, so that they are protected, preserved and part of our lives in future generations as well. As this ten-year vision winds down, I am very pleased with what has been accomplished and am excited about great opportunities on the horizon. Bringing Back Broadway was enthusiastically embraced by both the public and private sectors, and the initiative enjoyed significant participation of a wide range of community and civic leaders, property owners, business owners and residents. I cannot express enough gratitude to each and every person who has been involved in creating this legacy for Broadway. Broadway’s time is now. The revitalized Broadway corridor will complement and provide an essential historic connection between new large-scale downtown development projects, such as L.A. Live and Grand Avenue. We have accomplished a great deal together thus far - surpassing many of our own planned milestones while learning lessons from the efforts of other cities as well. These efforts and accomplishments have set the stage for what we will strive to achieve in the coming years, as Bringing Back Broadway continues to evolve and as we bring our plans to fruition. I am honored to lead this historic effort. I look forward to continuing to work with you as we bring back a Broadway that offers something for everyone in future generations to enjoy, while honoring its very special place in our hearts and history.